Anthony and Henrietta Cheshire﻿, Luke Pither and Kate Gerritsen﻿, Lucas Ihlein and Lizzie Muller, Louise Jane Cruikshank﻿, Michelle and Joe Fiordaliso﻿, Geoffrey Michael Clark﻿, Chris and Vanessa Wood﻿, Matthew Phelan﻿, Clay Ravin﻿, Anne Gleeson﻿, Angela King, Kath and Liam Wratten, Angharad Wynne-Jones, Greg Foyster and Sophie Chishkovsky, Stuart Jonai, Jackie Kerfoot and Samuel Jones﻿, Tim Woods, John and Franziska Ielo, Zara Pearson, Nicola Hensel, James Stuart, Su Dennett and David Holmgren, Sandy Lee Jones, Josh Franklin and Tracy Anthony, My Bearded Pigeon, Belinda Raposo and Cecile Knight, Diego Bonetto, Jeff Brownscombe and Rakaia Nault, Lena Mazza, Trudy and Primo Clutterbok, Mariana Teuila Isara, Petrus Spronk, Candice Boyd, Tia Crane and Jeremy Fullerton, Georgina and Geoffrey Williams, Adam Krongold, Deborah Kelly, Jill Berry, Tricia Meeley, Alana Napurrula, Bruce Thurlow, Becky Aizen and David Alter, Tiana Hokins, Britt Hollingworth and Josh Poidy, Annshar Wolfs and Jason Shorter, Lisa Jackson, Raia Faith Baster, Simon Holmes, Ivor Bowen, Sharonne Blum and Johnny Russell, Juliette Anich and Tosh Szatow, Lee and Dave Edmonds, Jason Maher, Licky la Grim, Peter Brandis, Petra Beuskens and Nick Wong, April Phillips, Joanne McCombe, Jacinta and Cameron Saunders, Nicole Brammy, Laurel Freeland, Dallas Kinnear. With just 3 weeks to go before we leave, the preparations for our trip are well under way. We had a garage sale today as part of the national Garage Sale Trail. Thank you to everyone who came by and who left with armloads of our goods that we are thrilled have found new homes. On the media front, Meg was interviewed by the lovely Megan Spencer today on ABC radio. You can read the blogpost here and listen to the full interview here. 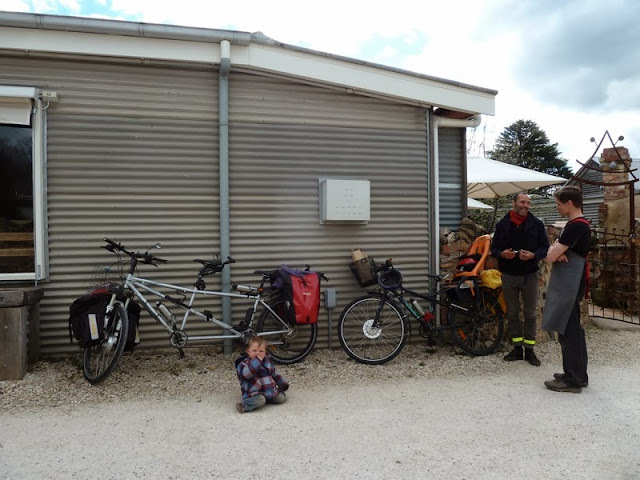 We headed to Trentham this afternoon (sans Zeph) with some of our panniers stuffed full of camping equipment for the first of a series of practice runs. 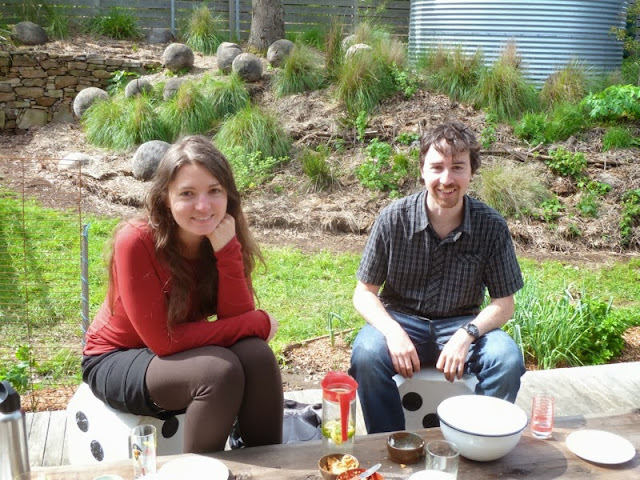 Thanks to Sophie and Greg who visited last friday (spruiking, or should we say spoking, their brilliant book Changing Gears at our local bookshop), we are feeling better prepared for the mid-November departure. 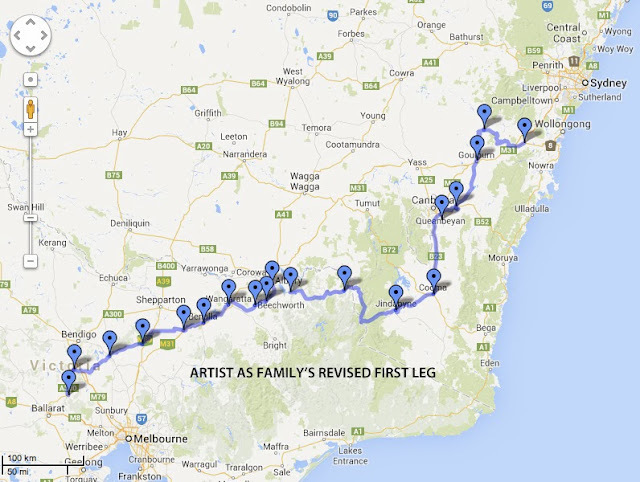 Sophie and Greg are peddling their wares to 30 bookshops in just 60 days, between Melbourne and Sydney. 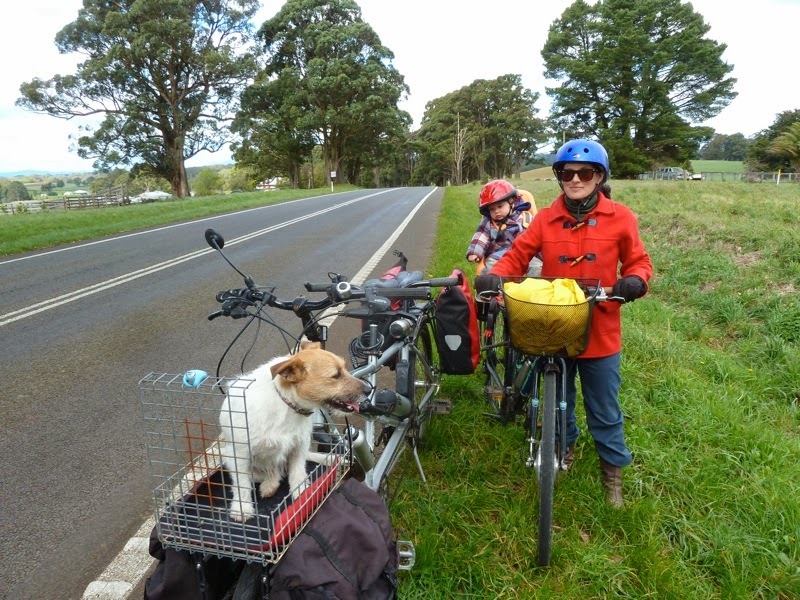 It was a pleasant 22 km to Trentham, which is precisely the distance we need to average each day in order to arrive in Moss Vale for the summer solstice. It was a sweet, slow ride after some early gear problems. Avoiding sticks and loose gravel in places were minor challenges, which nevertheless were helping us to get calibrated to the ins and outs of bike touring again. We arrived at our favourite bakery, RedBeard to refuel with a late lunch. We joked, if only there was a RedBeard at the end of every 22 km stint. Their food uses the best regional ingredients and their breads are baked in a wonderful old scotch oven. Al Reid, one of the two brothers who set up the business, quizzed us about our bikes, the electric kits we've had installed and the scope of our coming trip. As we ate, chatted and rested we recharged our bike batteries. Thanks John and Al. But the purpose of our trip is to find free food, and as we'll not have many RedBeards to call in on we'll need to find our own source of good food along the way. On the return leg we pulled over to photograph some lovely roadside clumps of new season cranesbill. The leaves make a good steamed vegetable. This mostly medicinal plant, used for the treatment of diarrhoea, gives new meaning to our current preoccupation with practice runs. The notes we have written so far for this particular cranesbill follow. Cranesbill (Geranium dissectum) purple flowered native of Europe; naturalised in Australia; roots are rich in tannin; used for the treatment of diarrhoea, gastro-enteritis, cholera and internal bleeding; externally, used for the treatment of cuts, haemorrhoids, vaginal discharges, thrush, inflammations of the mouth. It is best to harvest the roots as the plant comes into flower since they are then at their most active medicinally; leaves can be cooked as a vegetable; roots and leaves can be dried for future use; seeds roasted. 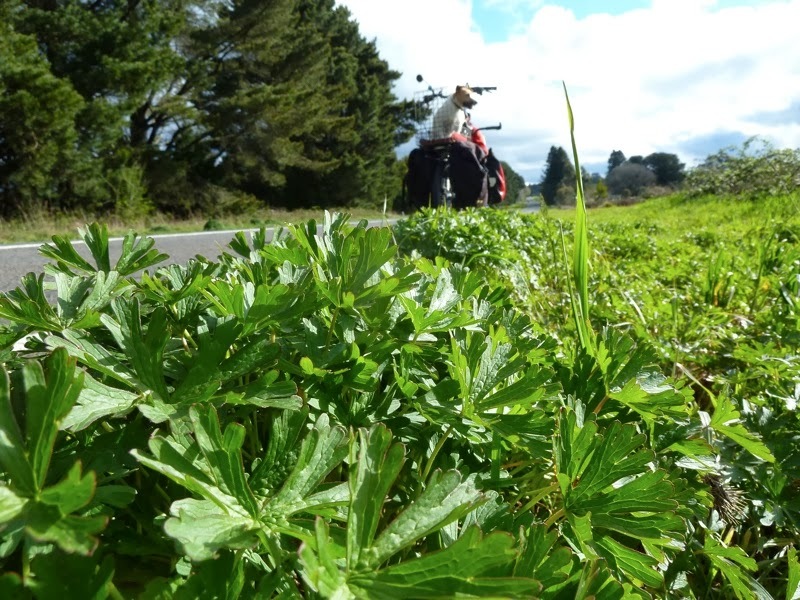 We also made this little video during the week, which speaks our notes on wild salsify. 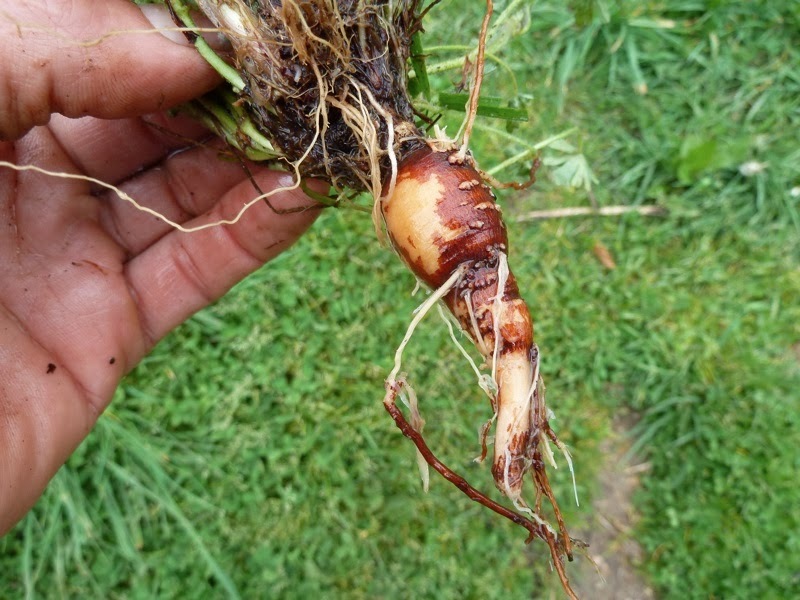 Now is a good time for many autonomous root vegetables such as spear thistles, dandelions, hawksbeard and salsify.